Jared would be proud of me. Whenever I grab lunch to eat in my office, I head over to Subway for a six-inch Veggie Delite with provolone. Just 280 calories. Yum. Depending on my mood and workload, I usually gobble down my Subway lunch between 12:15 and 1:00pm. On Monday, though, I started eating at 11:22. Like any good economist, I asked myself why. What inspired me to eat an hour early? Did I face some new incentive or new constraint that caused me to eat sooner? No, I didn’t. Monday was a normal day. No new incentives, no new constraints, no other changes. Except for one other thing: I brought lunch from home. Two slices of leftover BBQ chicken pizza. Also yum. If you are a well-trained neoclassical economist, your initial inclination will be to search for a subtle link between these facts. 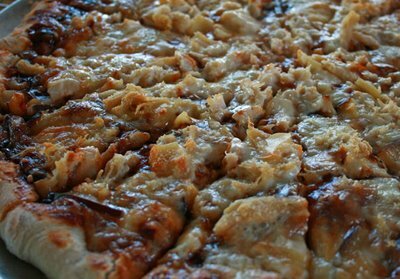 Perhaps cold pizza tastes better at 11:22 than an hour later. But that’s not true. Perhaps I ate early because I saved on travel time to Subway. No dice; Subway is only 90 seconds away. Perhaps these facts are unrelated, a mere happenstance. No again. From long experience I can tell you that I always eat lunch earlier when I bring it from home than when I get it at Subway. It’s a law of nature. Indeed, I have sometimes eaten lunch as early as 10:30 on days I brought it to work with me. This is particularly likely if I put the lunch in my desk, rather than in the refrigerator down the hall. The explanation for this behavior is, of course, psychological or, in the lingo of economics, behavioral. My lizard brain excels at knowing when food is near. And in getting me to eat it. Millions of years of natural selection didn’t favor creatures that wait an extra hour or two before they grab lunch. If the food is at hand, eat it now. So every time I bring lunch to work, I set off a battle of wills. My rational, patient, busy self who likes to eat around 12:30, and my primordial brain that wants to eat when the eating is good. That old brain has, if you will, the upper hand. It knows how to get what it wants. All it needs to do is remind me that food is near. I often feel as though lunch is calling to me from my desk drawer or, slightly more faintly, from the refrigerator. But that’s really the lizard brain doing its thing. Ignoring that voice takes willpower. But that saps the mental energy I need to focus on my work. To shut my lizard brain up, I have only one choice – to get lunch over with. So on Monday I happily started in on my six slices of pizza at 11:22, washed them down with some iced green tea, and got back to work. Perfectly rational behavior, I should note, given my urges, yet irrational as well measured against my “real” eating preferences. So it goes in the battle between our inner selves. But wait. Didn’t I say I brought two slices of BBQ chicken pizza from home? How did I end up eating six? Don’t worry, I didn’t steal a co-worker’s pizza from the refrigerator (if such thefts are a problem for you, please see this post). Instead, I played along with another feature of my lizard brain. Eating six slices of pizza is much more filling than eating two. So I divided each of the two large pizza slices into three smaller ones. I then got to enjoy eating six slices, not just two. I realize that sounds kind of insane. My rational, neoclassical side agrees. But it works. Perfectly rational given my urges, yet irrational as well. Such is life. Note: Pizza photo from Chocolate on my Cranium. My latest column for the Christian Science Monitor. One of the perils of writing a monthly column is the multi-week lag between writing and publication. Rick Perry and Herman Cain were near the top of GOP contenders when I wrote this. Today? Not so much. But the ideas are still worth analysis. And Newt Gingrich is promoting a flat tax, although it hasn’t been a central part of his campaign thus far. Tax reform has emerged as a key issue for GOP presidential hopefuls. Texas Gov. Rick Perry wants to scrap our current system and replace it with a 20 percent flat tax on individual and corporate incomes. Former Speaker of the House Newt Gingrich wants to do the same, but with even lower rates. Then there’s pizza magnate Herman Cain. His “9-9-9” plan would replace today’s income and payroll taxes with a trio of levies: a 9 percent flat tax on individuals, another on businesses, and a 9 percent retail sales tax. But Mr. Cain’s ultimate vision is to eliminate anything remotely resembling today’s tax system in favor of a national retail sales tax, which proponents call the FairTax. These three plans have much in common. Catchy names, for one. More important, they all focus on taxing consumption – what people spend – rather than income. Equally important, however, is the way the flat tax handles investment income. Individuals would pay taxes on their labor income but not on capital gains, dividends, or interest. That doesn’t mean capital income would escape taxation. Instead, the taxes would be collected at the business level. Businesses would pay taxes on all their income, regardless of whether it’s paid out as dividends or interest. They would also be allowed to write off the entire cost of new investments when they are made. The flat tax is thus a very close cousin to the FairTax and other retail sales taxes (which many Republicans like) and to value-added taxes (which they don’t). The logistics differ: A sales tax is collected on retail purchases, a VAT from businesses at each stage of the supply chain, and a flat tax from individuals and businesses. But the underlying economics work out the same: People get taxed only on their consumption. There are good reasons to favor a simpler tax system that emphasizes taxes on consumption over income. Some policy experts across the political spectrum embrace exactly that approach to tax reform. But all these plans would be much less progressive than our current income tax, and that’s neither appropriate nor politically viable. What we need are tax-reform proposals that would maintain progressivity while harvesting many of the benefits of simplicity and consumption taxation. The late Princeton economist David Bradford offered one simple approach: Add progressive rates to a flat tax. Columbia Law School Prof. Michael Graetz offered another: Pair a broad-based VAT with an income tax for folks with high incomes. These ideas might not have much traction among GOP primary voters. But they offer a much better starting point for reform than the plans on the table today. 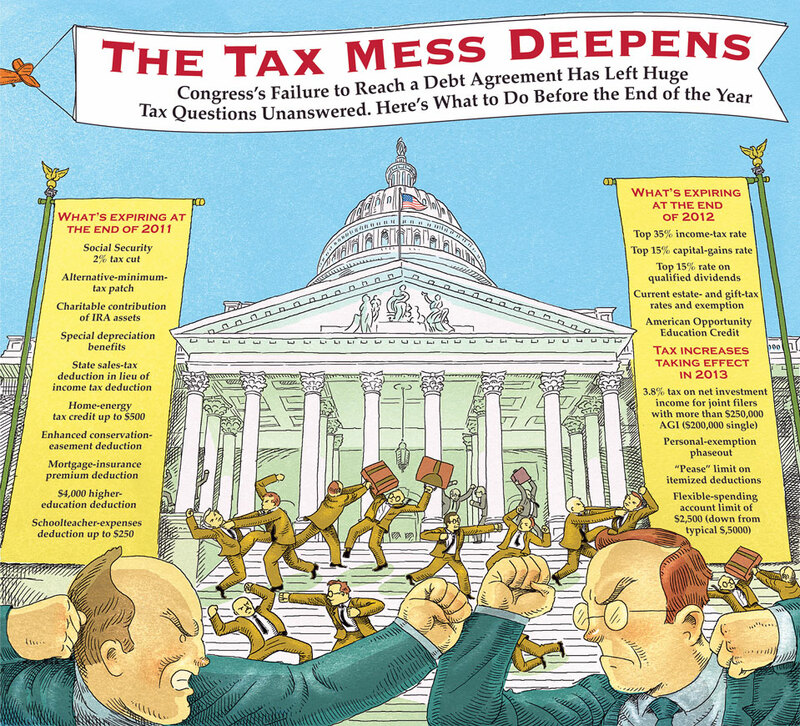 Graphic by Wesley Bedrosian as part of the Wall Street Journal’s weekend article on tax planning. After all, who doesn’t want to spend Thanksgiving weekend thinking about taxes? Esther and I got a scary piece of mail yesterday. The fine folks at the Internal Revenue Service sent our entire tax return back to us. Minus the accompanying check, of course. A cover sheet said we had failed to sign the return, which we filed on a timely basis in October. So what happened? Our best guess, echoed by several others, is that the IRS thinks one of our signatures is photocopied. But, let me repeat again, they are not. Our signatures are originals. Part of me is tempted to go all CSI and find a lab to confirm that. But I think we will settle for a friendly note to the IRS. And we will sign the returns again, this time in blue ink. Maybe with a Paper Mate Flair. P.S. I’ll get back to econ blogging soon. Super busy lately. A few weeks ago, I discussed a Quora thread explaining “how Apple sends technology back from the future.” The gist is that Apple is phenomenally good at managing its supply chain, particularly for innovative technologies that haven’t hit the market yet. 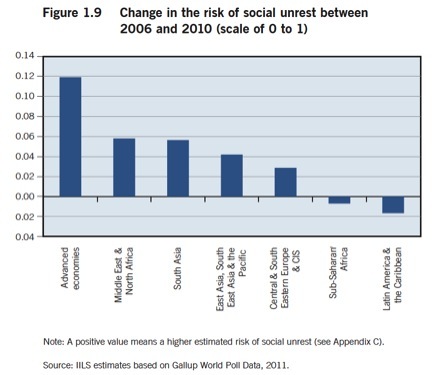 The risk of social unrest is on the rise around much of the world, according to polling data summarized in the International Labour Organization’s latest World of Work Report (ht: Tortsen Slok). With people in the streets from Athens to Oakland, the ILO clearly has a point about the advanced economies. • Income inequality and perception of injustice: Perception of economic and social disparities, and increasing social exclusion, is said to have a negative impact on social cohesion and tends to lead to social unrest (Easterly and Levine, 1997). • Fiscal consolidation and budget cuts: Austerity measures have led to politically moti- vated protests and social instability. This has been the case in Europe for many years, from the end of the Weimar Republic in the 1930s to today’s anti-government demonstrations in Greece (Ponticelli and Voth, 2011), but has also been a feature in developing countries, especially in over-urbanized zones, where protests have arisen following the implementation of austerity programmes imposed by the International Monetary Fund or the World Bank (Walton and Ragin, 1990). 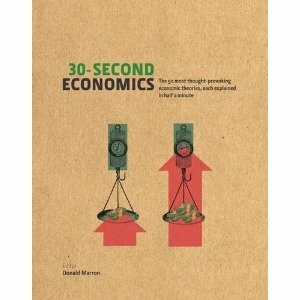 Meanwhile, societies that are more indebted tend to have higher levels of social unrest (Woo, 2003). • Higher food prices: In addition to collective frustrations regarding the democratic process, rising food prices were also central to the developments associated with the Arab Spring (Bellemare, 2011). • Heavy-handedness of the State: In countries where the State has resorted to excessive use of force (police and military) to tackle social upheavals instead of focusing on the actual causes of unrest, such actions have often exacerbated the situation (Justino, 2007). • Presence of educated but dissatisfied populace: Countries with large populations of young, educated people with limited employment prospects tend to experience unrest in the form protests (Jenkins, 1983; Jenkins and Wallace, 1996). This has been the case recently in many southern European countries, such Greece and Spain. • Prevalence of mass media: Past studies have highlighted the impact of radio on the organization of demonstrations, and clearly the use of the Internet (e.g. through the use of Facebook and Twitter) have played a role in recent incidences of unrest.